A River Style is a discrete river type, defined according to its valley setting, planform, bed material and assemblage of geomorphic units. The River Styles Framework outlines a generic set of procedures with tools for interpreting river character, behaviour, condition and recovery potential. The explanatory and predictive basis of the Framework provides a rigorous foundation for decision making in river management. Rivers show a remarkable diversity of character and behaviour in any catchment. Human activities, whether purposeful or otherwise, have impacted significantly on the inherent patterns and rates of river adjustment, altering what rivers look like and how they behave. Each catchment should be managed in its own right, recognising the patterns and connectivity of river forms and processes. River forms and processes are shaped by the configuration of the system and responses to natural and/or human-induced disturbance events. Applications of the River Styles Framework generate a coherent package of geomorphic information, providing a physical template for river rehabilitation activities. 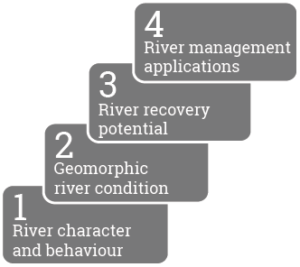 There are four stages in the River Styles Framework, which encompass description of river morphology, interpretation of behaviour and prediction of river recovery potential. These stages are outlined below. How does the character (morphology and setting) of ‘River A’ differ from that of ‘River B’? What are the processes that operate along Rivers ‘A’ and ‘B’? Each River Style is characterised by a distinctive set of attributes, analysed in terms of channel planform, the geomorphic units that make up a reach, and bed material texture. The identification and interpretation of geomorphic units allows interpretation of processes that reflect the range of behaviour of a River Style. River Styles, and their downstream patterns, are then appraised in terms of their landscape setting and the spatial and temporal linkages of geomorphic processes. For reaches of the same river style, is the geomorphic condition of ‘Reach 1’ better or worse than ‘Reach 2’? If processes are accelerated, or anomalous for that River Style, the reach is considered to be in poor geomorphic condition. If the character and behaviour of the reach is as expected for that River Style, then the reach is considered in good geomorphic condition. Given the limiting factors and settings in this catchment, are improvements in geomorphic condition likely, and over what timeframes can we expect them to occur? Morphodynamic perspectives on the connectivity of geomorphic processes through catchments, tied to appraisal of system evolution, provide a predictive context with which to interpret how changes in one part of the catchment have impacted elsewhere, and over what time frame. This provides a basis to predict the pathway of likely future river adjustment. These insights are used to analyse the recovery potential of each reach of each River Style (i.e. assess the likelihood of future improvement or deterioration of river condition. Stage Four of the River Styles Framework uses information from Stages 1-3 to identify target conditions for river rehabilitation for different River Styles. A prioritisation procedure is applied to identify where activities should start and where they are likely to have greatest success. These assessments are framed around the type of river, its condition and the river recovery potential.